Facility: The Wave spoils its residents with various facilities, including access cards, 24 hour security, swimming pool, basement, cctv, mini market, pharmacy, free bus service to Rasuna Epicentrum area, gym and fitness. The Wave apartment Rasuna Epicentrum is strategically located in the Golden Triangle area of â€‹â€‹the South Jakarta Business Center. Rasuna Epicentrum itself is an integrated complex consisting of office buildings, apartments and shopping centers. The area has easy access, an area surrounded by embassies, business centers, schools, shopping centers and international hospitals. 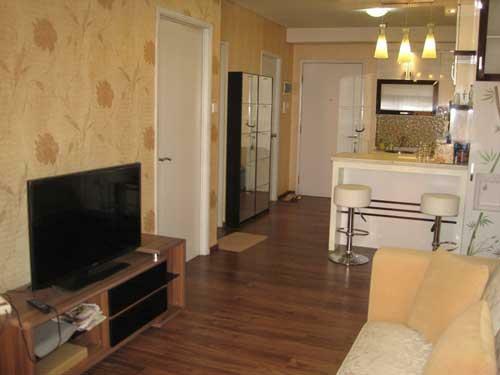 This apartment consists of several towers with unique arch shape and modern green life concept. consisting of: Tower Coral with 41 floors, Tower Sand with 42 floors, Tower Breeze with 37 floors. 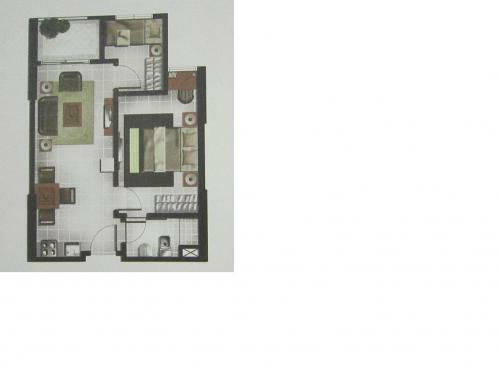 The units offered are one, two, and three bedroom types ranging from 40 to 92 square meters. 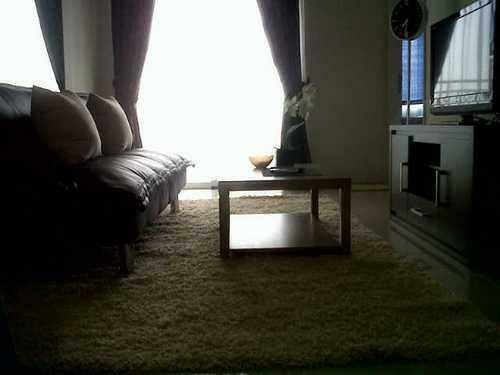 In addition, the apartment is well designed and has been furnished with furniture for your comfort. 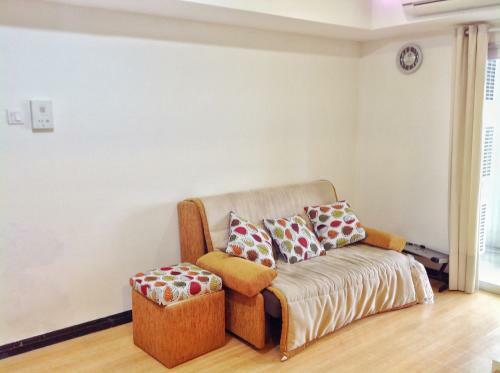 Condition: Fully Furnished with 3 Air Conditioning, Flat TV 32″ with cable channel (CNN,HBO,etc), Refrigerator, Dispenser, Water Heater, Balcony, Pantry and Kitchen Set with Gas Stove. Facility: Access card, nice swimming pool, kids pool, children playground, fitness, spa and sauna, function hall,laundry, ATM center,24 hours minimart Circle K, cafe, laundry & 24 hours CCTV security system that can be accessed through your TV, intercom to Lobby, spacious parking. 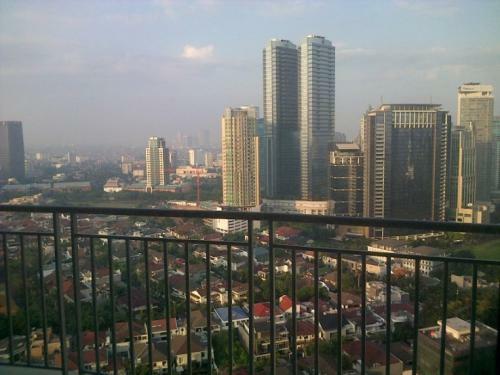 Additional Info: Located in the strategic triangle of South Jakarta. Easy access to Jl. HR Rasuna Said Kuningan, Jl. Sudirman, Jl. MH. Thamrin, Jl. 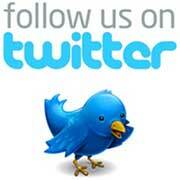 Gatot Subroto, Semanggi, Casablanca, toll road to Airport, SICC Sentul, Bogor, Bandung and many area. Nice place to live and sleep well. Surrounded by plenty of Banks, Mall and Supermarket (ITC Kuningan, Ambasador, Kuningan City, Lotte, Mall of Ciputra and Kota Kasablanka), Hospital (Medistra, MMC, Tebet Hospital), Dental Clinics, Hair Clinic, Food and Drinks area in Tebet,Cake center, Restaurants,All Fresh Fruit, Offices and near to culinary center and hangout places (Epicentrum Walk, Plaza Festival, Tebet Square). Other information are : 1.Showing by appointment. 2. 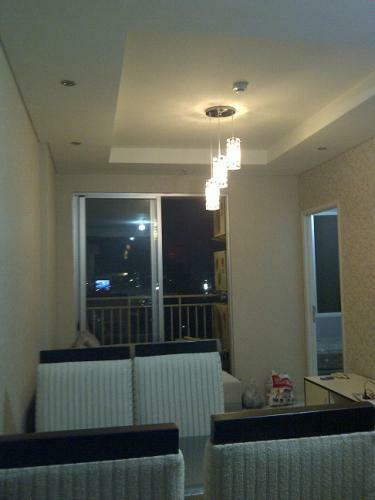 Minimum rent for 6 months or 12 months + 1 or 2 month deposit. 3. No monthly payment 4. Electricity and water bills are paid by the tenant according to the tenant’s usage. 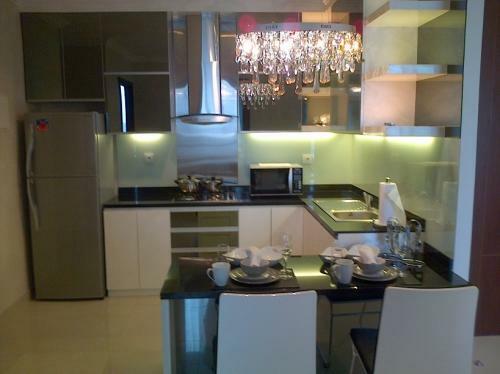 Rent Charge: Rp 7.000.000 per month (including service charge) minimum 12 months or 6 months. 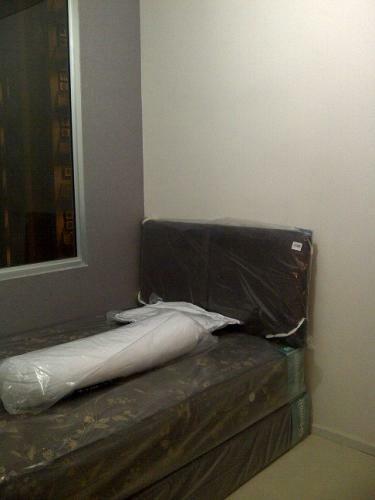 Condition: Brand new Apartment, luxury fully furnished, brand new furniture, full wallpaper, spacious arrangement. Master Bedroom: 1 Pk Panasonic air conditioning, Sony LED TV 40-inch, king-size bed (200×200 cm) with pillows, bolster, bed linen, full-size wardrobe with 2 sliding big mirror doors, beautiful curtains on the window, nice wallpaper, dressing table, city view. 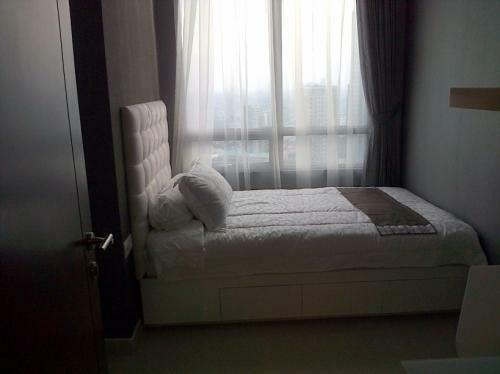 2nd Bedroom: 3/4 pk Panasonic air conditioning, semi queen-size bed (140×200 cm) with pillow, bolster, wardrobe with 2 sliding mirror doors, working table, beautiful curtains on the window, nice wallpaper, city view. 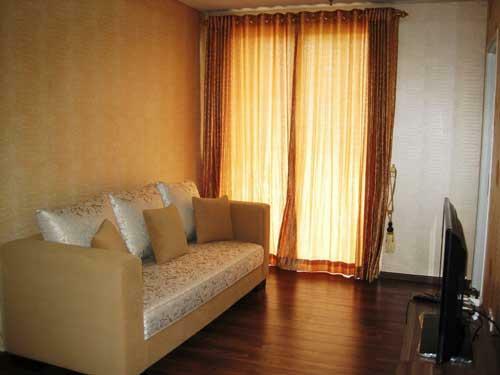 Living Room: 2 PK Panasonic air conditioning, 3 seater sofa and couch sofa with square table, 40 inch Samsung LED television, TV cabinet, nice wallpaper, big sliding glass door connecting to balcony, beautiful curtain available, wooden shoes wardrobe, city view. Main Bathroom: Shower with Ariston water heater, integrated bathroom set, shower glass door, closet, wash basin with mirror cabinet. 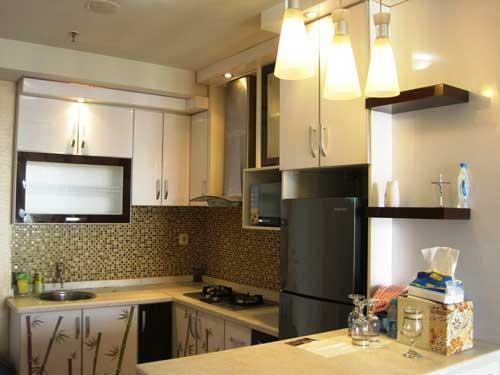 Kitchen: Nicely designed kitchen set with built-in gas stove and Modena exhaust hood, 2 door Sharp refrigerator, sink, full kitchen cabinet, Sharp water dispenser with sterilizer, Panasonic microwave, integrated bar/dining table with 2 chairs. 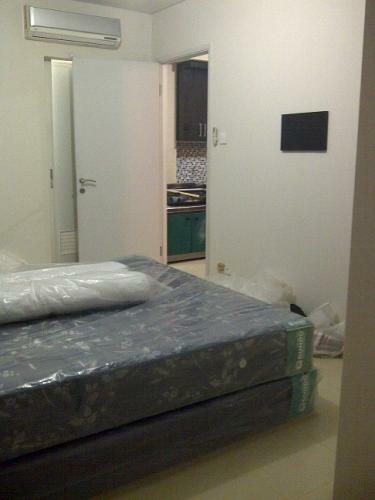 Maid Room: Used for service room with Electrolux washing machine. 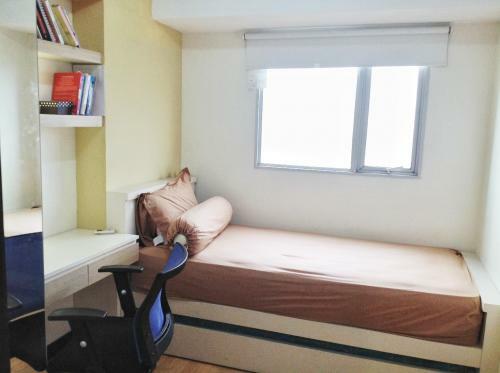 Unit Location: Strategically located near elevator and emergency stairs. Facility: Direct access to Kuningan City Mall, Lotte supermarket, lifestyle & entertainment center, thematic garden, water feature, swimming pool, jacuzzi / sauna pool, gymnastic fitness & aerobic, tennis court & basketball, jogging track, children playground, BBQ & picnic area, hi-tech security system, ATM, mini market, laundry. 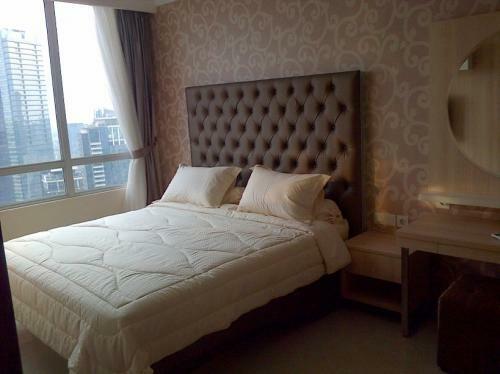 Additional Info: Located in Golden Triangle Central business Jakarta (Thamrin, Kuningan, Sudirman), a few minutes for 5 star and luxury Hotel, Embassy offices, 5 minute from Mega Kuningan district, 5 minute to shopping Mall (Ambassador Mall) and have private access to Kuningan City shopping Mall. Nice place to live and sleep. Surrounded by plenty of Banks, Schools, Hypermarket and supermarket (ITC Kuningan / Ambasador), Mega Malls (Kuningan City, Lotte Avenue, Kota Kasablanka), Hospital (Tebet Hospital, MMC, Medistra), Restaurants, offices. Close to culinary centre and hangout places (Epicentrum Walk, Plaza Festival, Tebet Square). Rent Charge: USD 1900/month. Minimum rent 1 year. Service charge, electricity, water, fixed-line phone, Internet, Cable TV are excluded. Master Bedroom: 3/4 pk LG air conditioning, queen-size bed (160×200 cm) with pillows, bolster, bed linen, full-size wardrobe with 2 sliding big mirror doors, roman blinds on the window, nice wallpaper, connecting door to main bathroom. 2nd Bedroom: 1/2 pk LG air conditioning, single-size bed (100×200 cm) with pillow, bolster, wardrobe with 2 sliding mirror doors, roman blinds on the window, nice wallpaper. 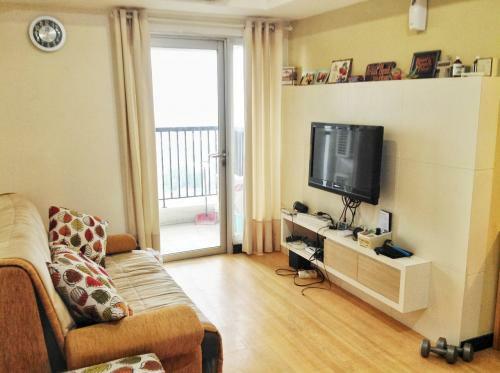 Living Room: 1 pk LG air conditioning, 3 seater sofa with round glass table, 40″ Samsung LED television with DVD player, TV cabinet, nice wallpaper, big sliding glass door connecting to balcony, curtain available, wooden shoes rack with mirror. Main Bathroom: Shower with Ariston water heater, integrated bathroom set, shower sliding door, closet, wash basin with mirror cabinet. 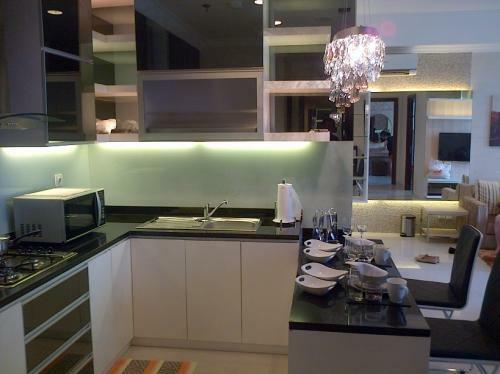 Kitchen: Nicely designed kitchen set with built-in gas stove and Modena exhaust hood, 2 door Samsung refrigerator, sink, full kitchen cabinet, Modena water dispenser with sterilizer, Modena microwave, integrated bar/dining table with 4 chairs. 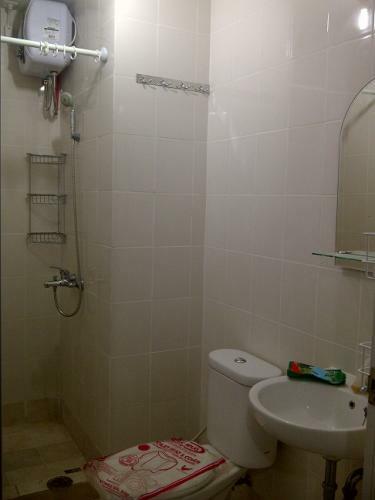 2nd Bathroom: Shower and tap water with squat closet. Facility: Nice Swimming Pool, Kids Pool, Squash Field, Fitness Center, Cafe, Body Massage, ATM Center, 2 Laundry, 24-hours Mini Market (Circle K), Children Playground, 24-hours CCTV Can Be Accessed Through Your Television, Function Hall, Spacious Parking. 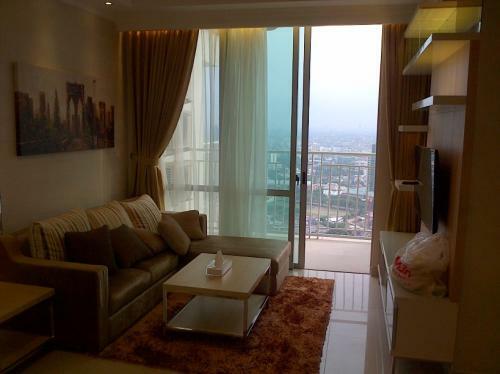 Additional Info: Located in the Golden Triangle of South Jakarta. Easy access to Kuningan, Sudirman, Thamrin, Gatot Subroto, Semanggi, Casablanca, toll road to Airport, toll road to Bogor, Bandung and other area. Near to business center. Nice place to live and sleep. Surrounded by plenty of Banks, Schools, Hypermarket and supermarket (ITC Kuningan / Ambasador), Mega Malls (Kuningan City, Kota Kasablanka), Hospital (Tebet Hospital, MMC, Medistra), Restaurants, offices. Close to culinary centre and hangout places (Epicentrum Walk, Plaza Festival, Tebet Square). 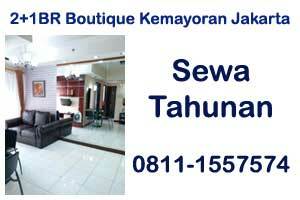 Rent Charge: IDR 8.000.000 per month (negotiable, minimum 6 months). Service charge included. Electricity, water, fixed-line phone, internet, Cable TV and parking fee (if any) are excluded (pay as per usage). 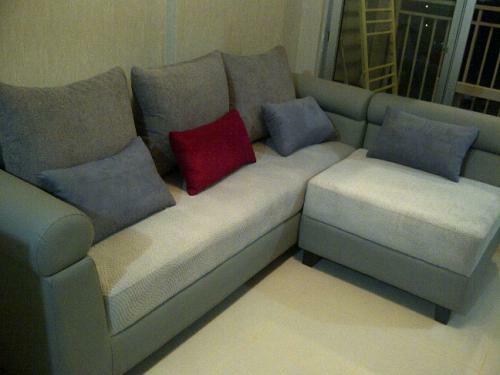 Condition: Fully Furnished (Brand New). 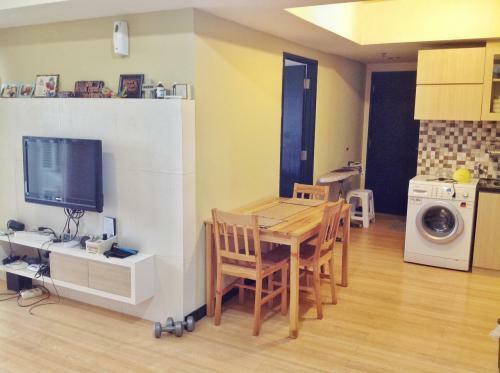 Living Room: Kitchen Set Granite Top Table, Dining Table, Sofa L, LED TV 32" LG, Refrigerator, Water Dispenser, Rice Cooker, AC LG Terminator 1,5 PK, Full Wallpaper, Gordyn. Master Bedroom: King Size (180×200), Full-Size Wardrobe with 2 Sliding Full Mirror Doors, AC LG 1PK Hercules (Low watt), LED 32" LG, Make-up Table, Full Wallpaper, Gordyn. 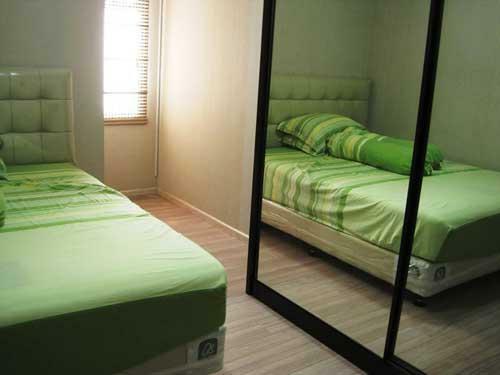 2nd Bedroom: Single-Size Bed (100×200), Full-Size Wardrobe with 2 Sliding Full Mirror Doors, AC LG 3/4 PK Brand New. 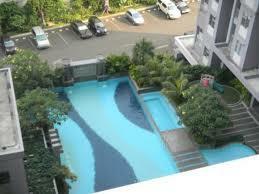 Additional Info: Located in the Golden Triangle of South Jakarta. 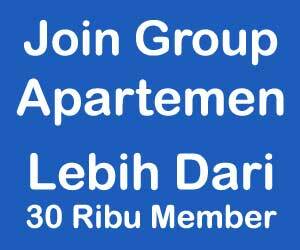 Easy access to Kuningan, Sudirman, Thamrin, Gatot Subroto, Semanggi, Casablanca, toll road to Airport, toll road to Bogor, Bandung and other area. Near to business center. Nice place to live and sleep. Surrounded by plenty of Banks, Schools, Hypermarket and supermarket (ITC Kuningan / Ambassador), Mega Malls (Kuningan City, Kota Kasablanka), Hospital (Tebet Hospital, MMC, Medistra), Restaurants, offices. Close to culinary centre and hangout places (Epicentrum Walk, Plaza Festival, Tebet Square). Condition: Fully Furnished Brand New. 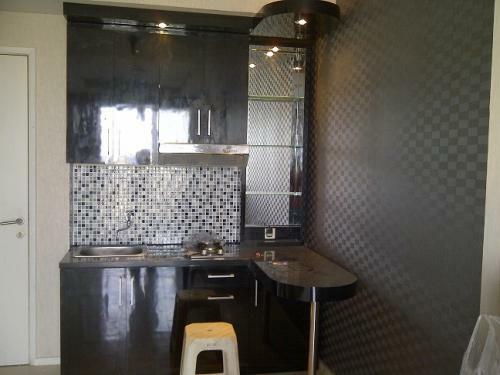 Rent Charge: IDR 7.500.000/Year (Min. 1 Year). Electricity, Water, Fixed-Line Phone, Internet, Cable TV and Parking Fee (If Any) are Excluded (Pay as Per Usage). Condition: Fully furnished with parquet floor, brand new furniture, full wallpaper, electricity 4400 watt, spacious arrangement. o Master bedroom: 3/4 PK LG air conditioning, queen-size bed (160×200 cm) with pillows, bolster, bed linen, full-size wardrobe with 2 sliding big mirror doors, roman blinds on the window, nice wallpaper, connecting door to main bathroom. 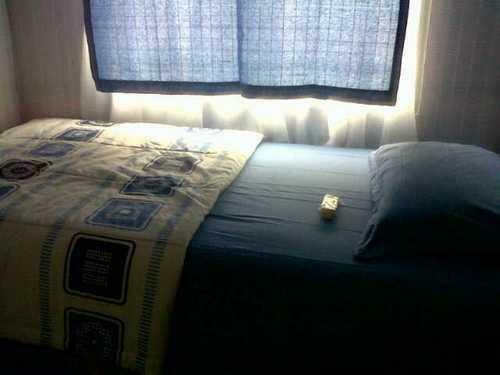 o 2nd bedroom: 1/2 PK LG air conditioning, single-size bed (100×200 cm) with pillow, bolster, wardrobe with 2 sliding mirror doors, roman blinds on the window, nice wallpaper. 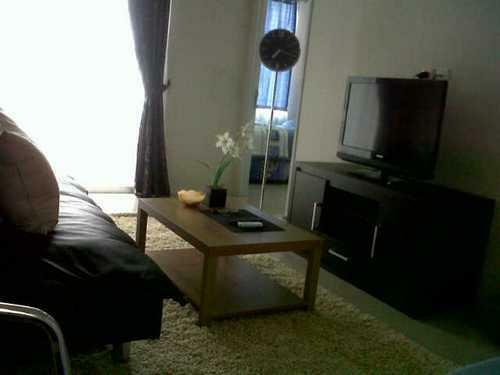 o Living room: 1 PK LG air conditioning, 3 seater sofa with round glass table, 40" Samsung LED television with DVD player, TV cabinet, nice wallpaper, big sliding glass door connecting to balcony, curtain available, wooden shoes rack with mirror. 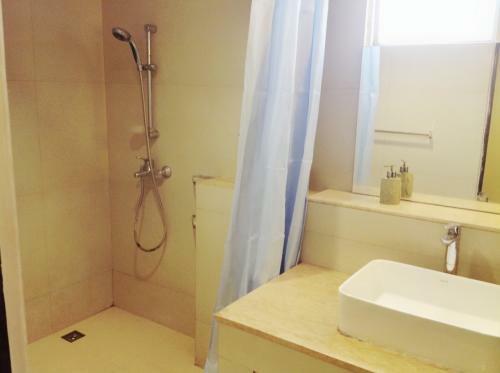 o Main bathroom: Shower with Ariston water heater, integrated bathroom set, shower sliding door, closet, wash basin with mirror cabinet. 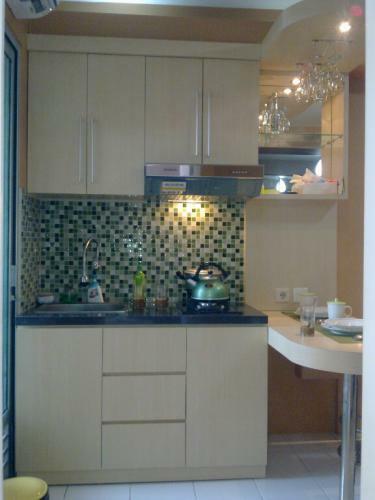 o Kitchen: Nicely designed kitchen set with built-in gas stove and Modena exhaust hood, 2 door Samsung refrigerator, sink, full kitchen cabinet, Modena water dispenser with sterilizer, Modena microwave, integrated bar/dining table with 4 chairs. 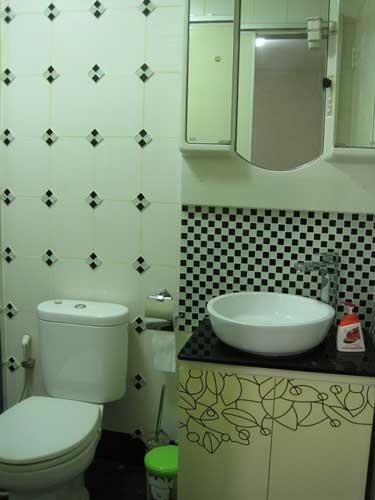 o Maid room: Installed wooden racks, Samsung washing machine, nice wallpaper. 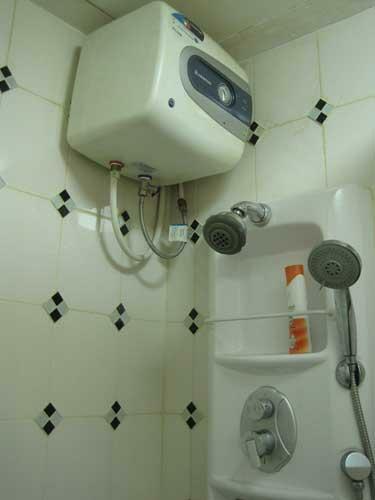 o 2nd bathroom: Shower and tap water with squat closet. 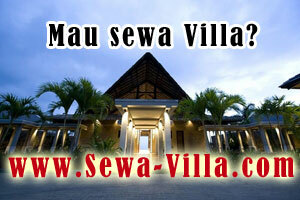 Rent Charge: IDR 9.000.000 per month (min. 1 year). Electricity, water, fixed-line phone, internet, Cable TV and parking fee (if any) are excluded (pay as per usage).